I love the colour pink but i never wear it, it was only a matter of time before i gave into this seasons hue of choice..and picked up some other bits along the way too. I find this time of the year notoriously hard to dress for, i always end up either wearing too little and freezing or wearing winter clothes and sweating to death. 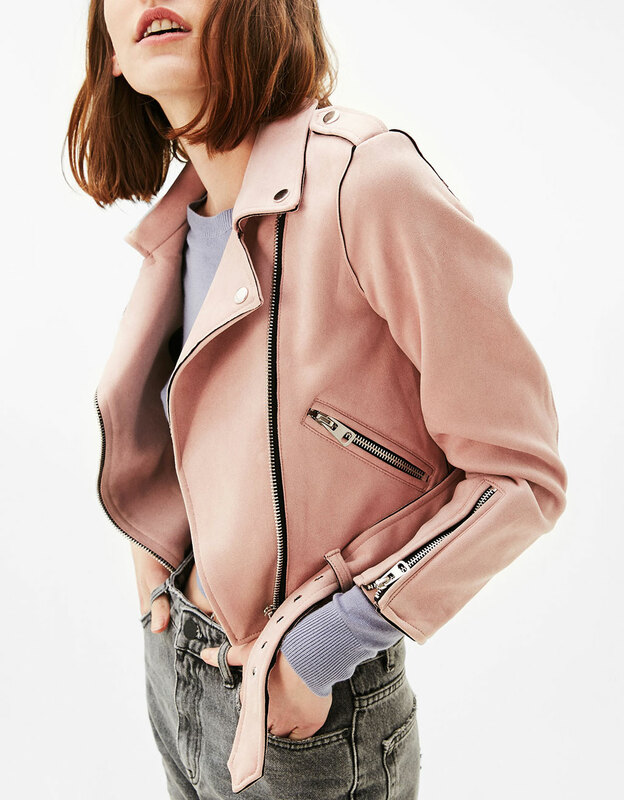 This Bershka jacket has come to solve all of my problems, could you get anymore springy than faux suede and blush pink? Nope, didn’t think so. This has quickly become my favourite piece of clothing, i feel like while it’s a statement piece the tone of pink means it doesn’t make me stand out like a sore thumb, and because I’m someone who usually doesn’t wear pink it’s an easy place to start. When i buy shoes it’s always a really considered purchase, i’ve talked about it before but i usually alternate between the same 2 pairs of converse and 3 pairs of boots but i decided it was about time i picked up something new. The first are these Missguided boots and although i do already have a pair of black heeled ankle boots these are different..okay? The heel on these is 4.5 inches and they don’t have a platform meaning they’re not the most comfortable boots in the world but I’m going to reserve these for events and days where i’ll be travelling by car .. rather than risking not getting a seat on the tube. 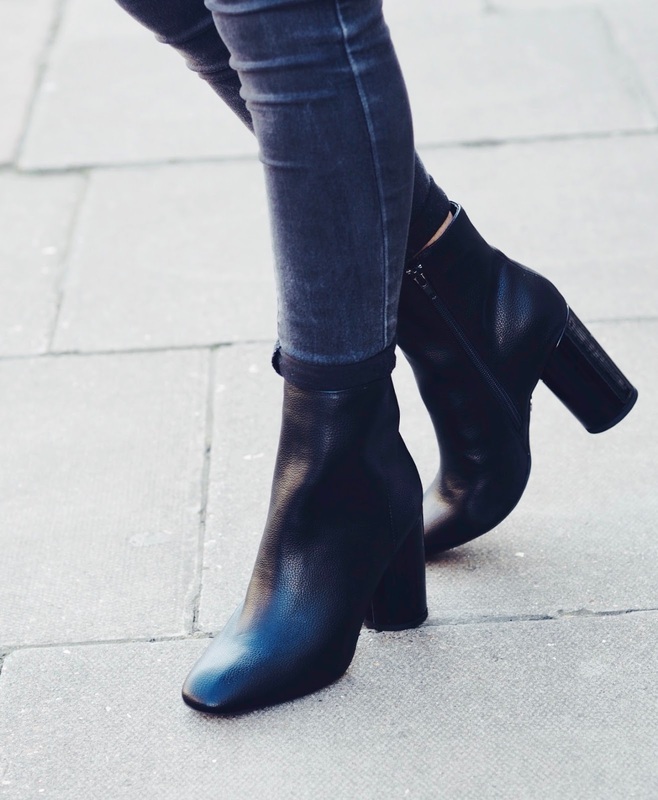 A nice pair of simple black ankle boots are definitely a wardrobe staple, and I’m so happy to have added these to mine. Also from Missguided are these slightly more day time friendly marble detailed trainers, yes my marble obsession extends to me even managing to incorporate marble into my shoes .. i know. I love these, i feel like they fill the gap in my shoe wardrobe and i now understand what people mean when they actually want to keep their trainers in pristine condition. These are perfect for matching with comfortable everyday outfits but still pull things together with their marble backing, i am in love. The photos are amazing in this Maria! I love the pop colour, and it's not too harsh or attention seeking. Maan the jacket is amazing! I tried out one just like this in Zara. Also love the boots, gorgeous.